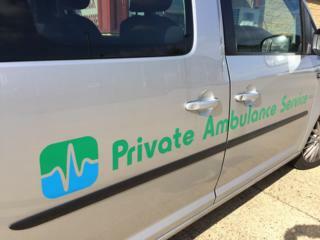 An ambulance service which is in the process of liquidation is being taken over by an NHS trust. East of England Ambulance Service Trust (EEAST) has a caretaker contract to provide non-emergency patient transport in Bedfordshire and Hertfordshire. The service had been run by the Private Ambulance Service (PAS) which took on the contract from another private firm in March. On Thursday PAS said a winding-up order had been lodged with the High Court. Staff were being spoken to on Monday at PAS headquarters in Basildon, Essex, about how they would be affected. Former PAS driver Riz Basharat, who worked for the service until a few months ago, welcomed the company's demise. He said: "That's the best news for the patients and for their employees. "They have just made a mockery of the whole system and I don't know how the NHS even allowed them to take on this contract. Basically a shambles from day one." Tim Roberts of Unison said it had been "concerned" for many months about the "abysmal" service PAS had been operating for patients and staff. "We know of members who are owed thousands of pounds and we have had to commence legal action to try and get some of their wages back," he said. Clinical commissioning groups (CCGs) in Bedfordshire, Luton and Hertfordshire said EEAST was running a skeleton service on Monday, "providing transport for patients attending priority appointments like dialysis or cancer treatments, whilst EEAST establishes a full service". Patients attending routine appointments are being asked by the CCGs to make their own way to hospital. PAS is also facing a £75,000 compensation claim from widow Kim Page from Laindon, Essex. Her husband died from a heart attack in February 2015 and a coroner ruled he had been the victim of a "serious failure of care" by PAS ambulance staff. Mrs Page's solicitor, Stephanie Prior of Osbornes Law, said she "expected the compensation claim to be upheld by the company's insurers". In August 2016 the Care Quality Commission carried out an inspection of PAS and found poor standards in infection control, staff not having enough time between shifts and poor leadership arrangements. A BBC investigation also revealed concerns over poor staff training at the company which employs 300 staff with a fleet of 100 vehicles. PAS has been asked for a response to the criticisms but has yet to comment.